Small volumes of anti-DIABLO antibody vial(s) may occasionally become entrapped in the seal of the product vial during shipment and storage. If necessary, briefly centrifuge the vial on a tabletop centrifuge to dislodge any liquid in the container`s cap. Certain products may require to ship with dry ice and additional dry ice fee may apply. This gene encodes an inhibitor of apoptosis protein (IAP)-binding protein. The encoded mitochondrial protein enters the cytosol when cells undergo apoptosis, and allows activation of caspases by binding to inhibitor of apoptosis proteins. Overexpression of the encoded protein sensitizes tumor cells to apoptosis. A mutation in this gene is associated with young-adult onset of nonsyndromic deafness-64. Alternative splicing results in multiple transcript variants encoding different isoforms. 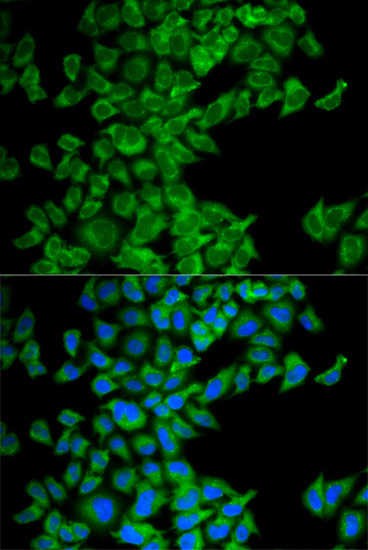 Immunofluorescence analysis of MCF-7 cells using DIABLO antibody. 1. Mechanistic studies showed that Smac can inhibit the expression of Survivin, promote cell apoptosis of drug-resistant ovarian cancer cells and reverse the drug resistance.